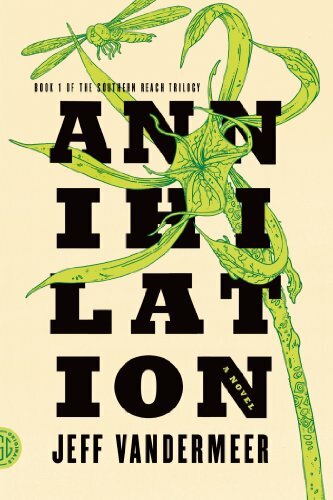 In Annihilation, or rather in Area X, VanderMeer has built a world that captures you, slowly draws you in and you’re much too busy watching in wonder to realize that you’re sinking into something that may well go over your head. Area X feels unlike anything I ever read, it is so strange. It works with the human-nature-balance in a way that makes it clear how unnatural humanity’s refusal to see itself as part of nature is and at the same time, re-examines that very same relationship. Plus, apart from the philosophical implications you may or may not read in the text, Area X is just damn creepy. That becomes nowhere clearer than in the Crawler and what it writes. It’s fascinating and you can spend a lot of time trying to interpret it, or you can assume that it doesn’t make sense and isn’t supposed to make sense anyway. But whether you read things in(to) it or not, the atmosphere created is inescapably unsettling. The book is being told through the biologist’s diary and it’s a very distanced narration. Nevertheless it manages to evoke a sense of intimacy that is quite astounding. It seems made to make it hard to connect with her, starting with the refusal of using any names, but I did absolutely empathize with her and was rooting for her. It is a little disappointing that this connection didn’t translate to the relationship between the characters. I think I would have enjoyed if a friendship with surveyor had developed, even if the non-friendship between the two was very fitting. I do hope that [SPOILER] the biologist will find her husband somehow [/SPOILER]. In any case, I’m curious about what will happen next. I do hope that the series continues with her, and at the same time, I hope to get an entirely different perspective. Summarizing: Intriguing, fascinating, creepy – and I can’t wait to read on. This entry was posted in books and tagged Annihiliation, Jeff VanderMeer, The Southern Reach Trilogy by kalafudra. Bookmark the permalink.